Well it warmed up a bit and I got a chance to check a few things out on my new coolant leak issue -- hoses and belt all seam tight, no leaking up front, but a slow steady leak from the engine area -- here are two photos from above and below -- I also checked error codes and fuses and all are OK. What do ya'll think?? Do I need to start looking for a new water pump or are there other things I should check? snippit - “I regard them as my family,” McLean said of his co-workers. “You’re not going to leave your brother or sister behind.” It’s a lesson he learned in the Air Force. 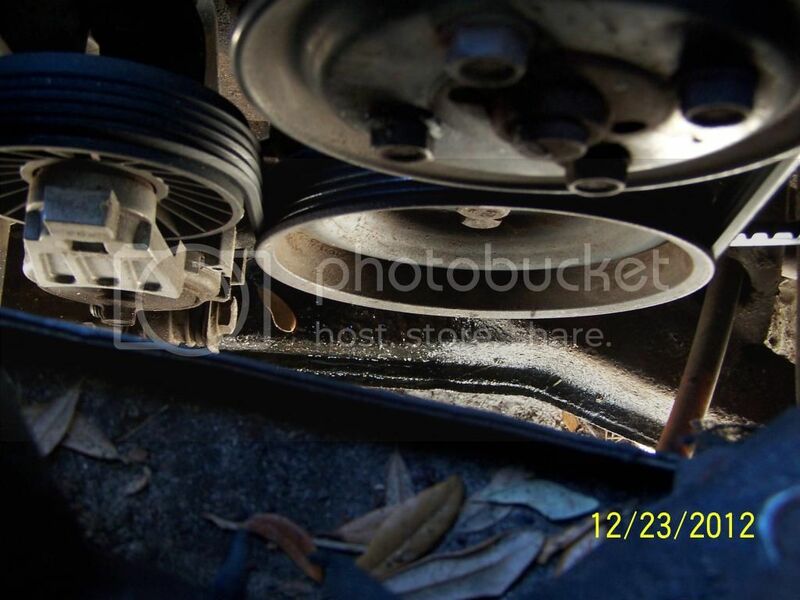 Looks like I'll be attempting to purchase (not from Autozone) and replace the water pump after Christmas, yuck -- meanwhile any special tips or tricks I should be aware of before I dig in? If everything goes well, I might even make it to the January meeting -- it's been 4 - 5 months since I've seen ya'll. Happy Christmas Eve ya'll -- Hope everyone has a great Holiday!!! Just remember which bolts go in what hole. If I recall there are a few different bolt sizes. Yeah, seems that's a big theme, I've been researching the procedure all day -- looking at the pennock forum etc. It looks a little intimidating and will probably take me a couple of days for sure ^^0^^. I took the easy way out and had GT Service do the water pump on my 88. They discovered a leak problem when it was in for service for some other issue. I have a low frustration level when doing repairs on the Fieros, even though I do many, but only what I consider simple ones. Need tone careful to not break these soon the timing cover while changing the pump. But on the other hand could be an opportunity to check the timing chain!!!!! I took the easy way out and had GT Service do the water pump on my 88. I have a low frustration level when doing repairs on the Fieros. Just make sure the water pump has a metal impeller not plastic as plastic will fail. Good morning my fiero friends -- Hope ya'll had a good Christmas. Any holes that extend into the water jacket require that the bolt have a liberal amount of RTV on the end to seal the bolt threads. All other bolts should have a very light coating of engine oil. The small bolts going into the timing cover itself should have a thin coat of anti-seize to prevent electrolytic corrosion. Will this be easier or should I go ahead and remove these and take advantage of the opportunity to clean the wiring etc?? Next -- which of the below is correct??? Loosen and remove the four bolts holding the water pump pulley in place. There is no need to loosen the alternator belt. access to the bolts is severely limited by the water pump pulley. The solution was to remove the pulley after removing the belt, before loosening any of the water pump bolts! Hey everyone. We installed dodge runners belt tensioner today. We need a new alternator bracket for her car. First off the bolt thru the top of the alternator is seized tight and second the bracket broke in half. So if there is anyone out there with one we could sure use it. The unit is installed and works great but the bracket should be changed. This was before tech day last year ... do ya'll remember if a new alternator bracket was installed on the tech day (Feb last year) and / or will this be a factor I'll need to consider during the waterpump project? Picked up the water pump (no plastic!!) this morning and hope to start something tomorrow (was in Jacksonville all day today). Sorry to keep bugging ya'll -- your help / advice is really appreciated. I don't think it's that critical, just use common sense and don't over tighten. Be especially careful of the two bolts around that "un-supported" area of the timing cover. I believe it's around the 11 o'clock position.